Eighteen months. Many things that we somehow feel lasted a lot longer, only lasted eighteen months. The pony express was only in operation for eighteen months. The rabbit test was only used for eighteen months (and the poor rabbit always died). The Empire State Building was put up in only eighteen months. And the Teenagers only lasted for about eighteen months. Why do we feel that it was so much longer? Because of the profound influence that they had on Rhythm & Blues and Rock & Roll. 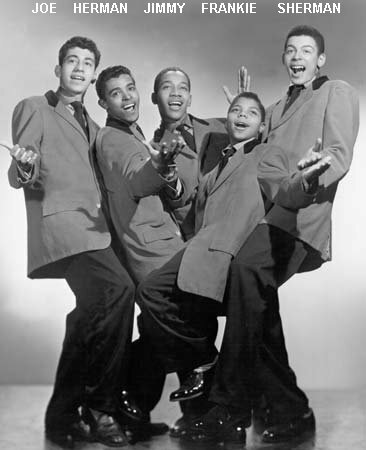 There were only five vocal group leads, prior to the Sixties, who had that degree of influence: Bill Kenny of the Ink Spots started it all; Sonny Til of the Orioles made every guy want to start a vocal group; Jimmy Ricks of the Ravens influenced an entire generation of bass singers; Clyde McPhatter of the Dominoes influenced the same generation of tenors; and Frankie Lymon of the Teenagers, with his child-like tenor/soprano voice caused the spawning of an uncountable number of groups that tried to capture the same "kid sound." Yes, the Teenagers were influential, and their influence was felt for almost a decade after they formed in 1955. 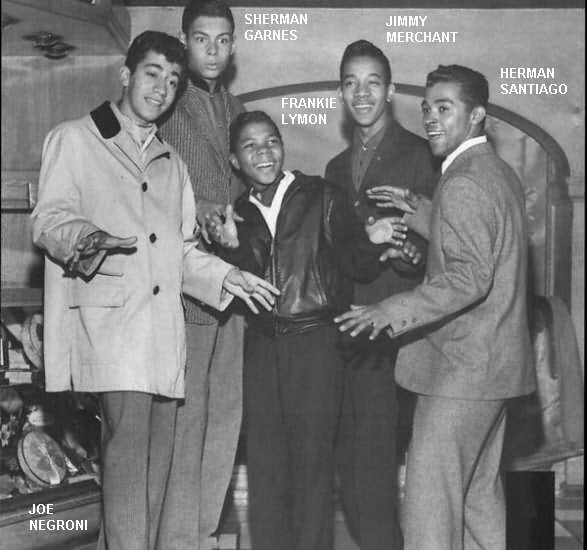 There were five of them: Frankie Lymon (lead tenor), Jimmy Merchant (first tenor), Herman Santiago (second tenor), Joe Negroni (baritone), and Sherman Garnes (bass). 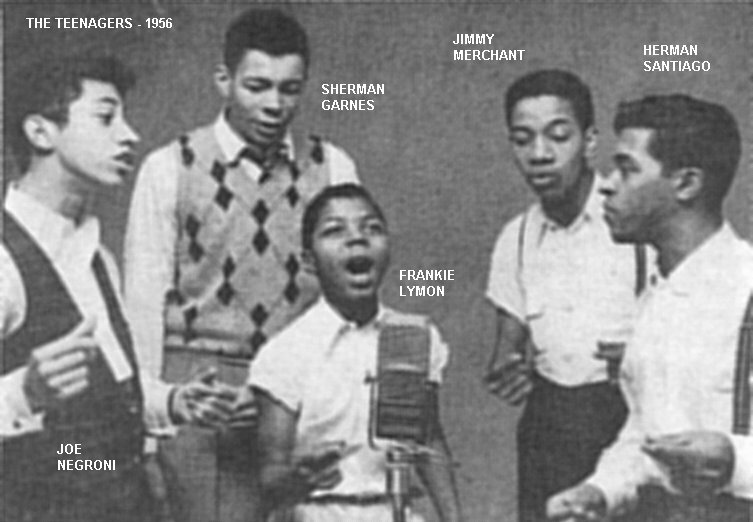 They were not the first group to have a young lead: Frankie was 13 when he started recording; both Ray Wooten of the Mello-Moods and George Grant of the Castelles had been 16 when their groups had first recorded several years earlier, although they both sounded much younger. (In spite of their ages, however, both the Mello-Moods and the Castelles sang sophisticated, adult songs for an adult audience.) But the Teenagers were "in the right place at the right time" (to coin a phrase), and rode straight to the top of the nascent Rock and Roll craze. The way to the top was remarkably easy; the way down wasn't. 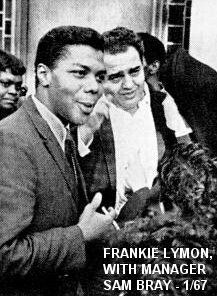 Frankie later told Art Peters (for an article in the January 1967 issue of Ebony): "I never was a child, although I was billed in every theater and auditorium where I appeared as a child star, I was a man when I was 11 years old, doing everything that most men do. In the neighborhood where I lived, there was no time to be a child. There were five children in my family and my folks had to scuffle to make ends meet. My father was a truck driver and my mother worked as a domestic in white folks' homes. While kids my age were playing stickball and marbles, I was working in the corner grocery store carrying orders to help pay the rent." Jimmy Merchant grew up in the Bronx, New York. There was enough singing going on there for him to start learning about it, not only contributing his voice, but learning how popular music was structured and arranged. In 1954, his family moved to the Washington Heights section of Manhattan, where he met bass Sherman Garnes at Edward W. Stitt Junior High School at 164th Street and Edgecombe Avenue. They became part of a group (what else?) that was called the Earth Angels, after the Penguins' monster hit of the same name. 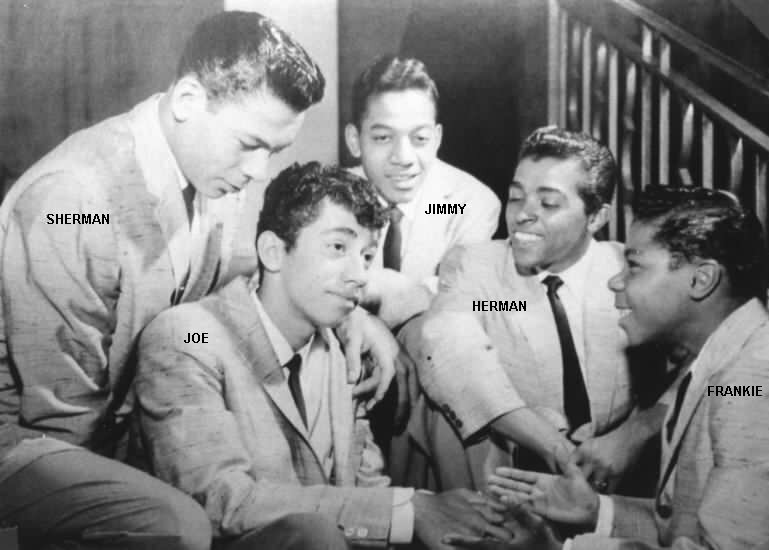 Then Sherman hooked up with a Hispanic neighborhood friend, Joe Negroni (who was in the process of forming a group, to be called the Ermines, with his friend Herman Santiago). Joe asked Sherman to sing bass and to bring his friend Jimmy along. History was about to happen. One day the Ermines did a talent show at PS 143. The Cadillacs were guests on the show (Earl Carroll, Earl Wade, and Bobby Phillips had gone to PS 143 themselves). It was memorable because it was the first time that the Ermines were asked to sign autographs. After the show, in honor of the Cadillacs, they decided to change their name to the "Coupe de Villes." This only lasted a short time however, and then a new, more eloquent name: the "Premiers." One night, practicing in Sherman's hallway, one of the tenants told them that he'd give them some letters that his girlfriend had sent him, so that they could possibly write some original material based on the contents. (This was actually done in self-defense, to get them to sing something different for a change; listening to a group practicing the same songs over and over and over could really get on your nerves.) These weren't poems that could be set to music, as much as love letters with some romantic, poetic interludes. One of them featured the words "Why do birds sing so gay?," which fit in with lyrics that Jimmy had been writing. (He had a notebook full of songs that he wrote in a 1-6-2-5 chord pattern. When he got the letters, he was reluctant to use any of the material, but the Premiers figured it wouldn't hurt to be nice to the guy.) So Jimmy worked with it, creating a song (essentially a ballad) for Herman to lead. Along the way, Herman changed some of the lyrics. They did neighborhood talent shows and finally made it to the big time: a talent show at Stitt JHS itself. 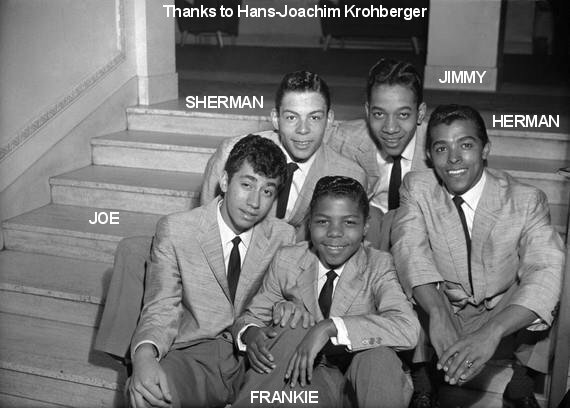 On the same bill was a young mambo group, featuring 12-year-old Frankie Joseph Lymon on bongos and his older brother Howie, Junior on congas. (Frankie had two more brothers at home: Lewis and Timmy. it was a musical family: father Howard, Senior, a truck driver, belonged to an amateur gospel group.) At a rehearsal, Frankie approached the Premiers, telling them how good they sounded. 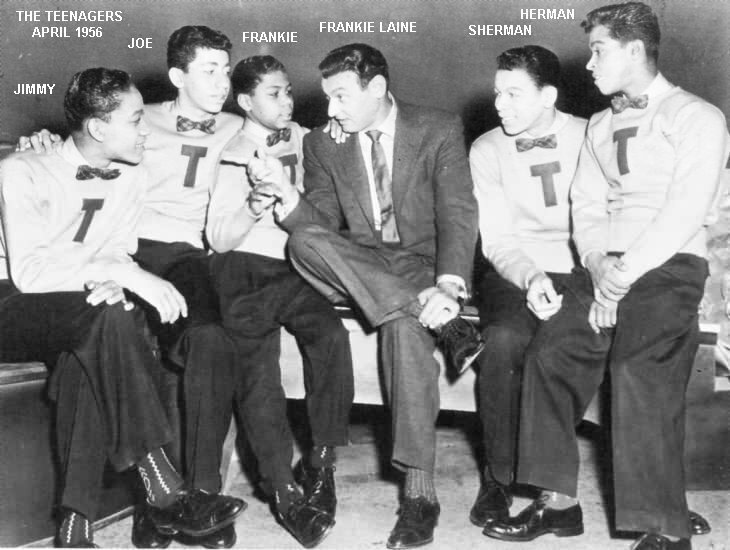 They started jamming together and the guys were impressed with the sound of Frankie's high tenor/soprano voice and showmanship [read "ham"] qualities. (Richard Barrett said of Frankie that "he was born to the stage.") They agreed to do it again sometime. Well, they did. The talent show came and went, but Frankie didn't; he stayed. Nothing formal, mind you, he just stayed. One night they were heard by Richard Barrett, lead of the Valentines. Actually, he really couldn't help hearing them, since they'd sometimes practice on the corner near the grocery store in which Frankie worked; Barrett lived above the store. He later came to one of their rehearsals at Stitt (the Valentines sometimes practiced there too) and said he'd see what he could do about bringing them to audition for George Goldner (owner of the Valentines' label, Rama). 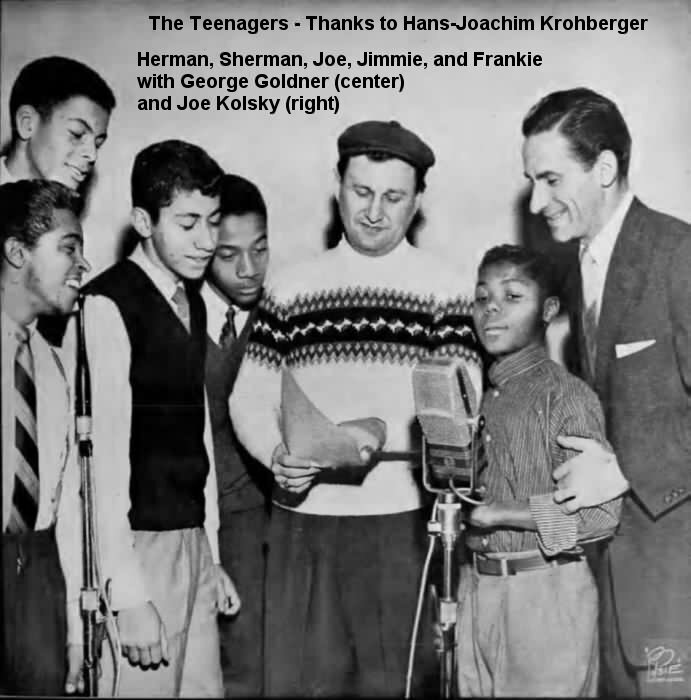 At this time, Herman was the usual lead of the group, but sometimes he and Frankie did a duet lead, and sometimes Joe would front. Finally, Barrett talked George Goldner into hearing the Premiers. Goldner didn't really want to hear them, but Barrett conned him into it by telling him that two of the guys were Spanish. (Goldner, who also owned Tico Records and was married to a Puerto Rican woman, was big into Latin music. This was the selling point that Barrett used.) 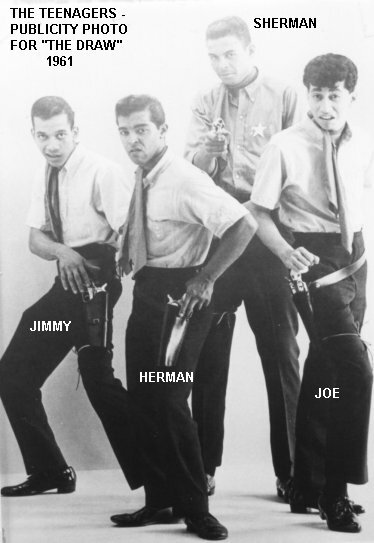 They auditioned (on a day that the Cleftones were there rehearsing for a recording session), by singing songs they'd hear on the radio: "You Painted Pictures" (led by Joe), "That's What You're Doing To Me" (led by Herman), and "Why Don't You Write Me" (another Herman lead). Although Frankie was in the background, he wasn't the type to stay there for long. He was very energetic, bold, and cute; small he was, but also mature. Also, his voice stood out. Goldner ended up asking Frankie if he ever fronted the group. His reply was "I can sing anything." So Goldner asked them if they had any original songs. There were only two that they were comfortable with at this point, although neither was complete: "Come On Baby" (the future "I Want You To Be My Girl") and "Please Be Mine". Frankie sang lead on these for Goldner (although they were just partial songs). The other two originals were "Why Do Birds Sing So Gay" and "Am I Fooling Myself Again," but Jimmy says that they didn't sing either that day, regardless of what's been written before. 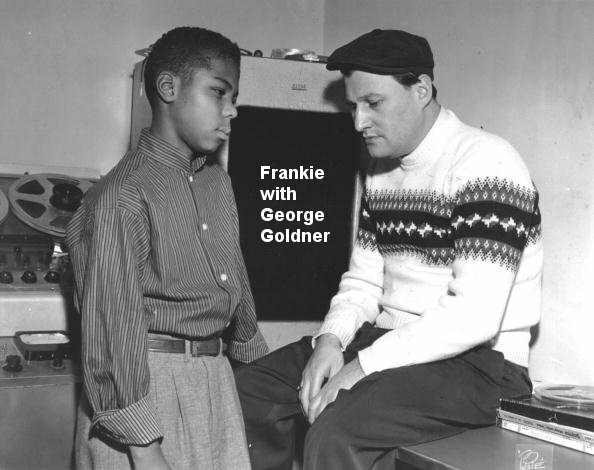 After hearing Frankie do "Come On Baby," Goldner said "From now on, kid, you're singing the lead. Come back with the original material with you singing lead." (You really can't say too much about George Goldner's ability to pick talent.) Frankie instinctively knew how important the audition was for the group. Goldner asked Barrett to sit in on their rehearsals and guide them along. Since both "Why Do Birds Sing So Gay?" and "Come On Baby" were deemed too short in their speeded up versions, Barrett helped them to add intros. Contracts were produced (for their parents to sign) as they prepared for the recording session. Naturally, they would be managed by Goldner. (Actually it was Goldner and his partner Joe Kolsky. Together they owned Rama, Tico, and the new one, Gee. In 1957, they'd also start Roulette Records. 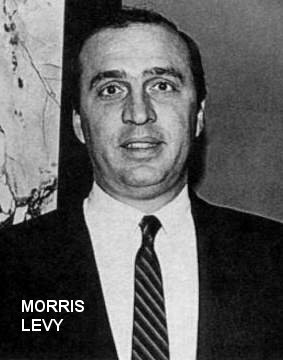 Kolsky was the brother of Phil Kahl, who was Morris Levy's partner, and Levy managed Alan Freed - this gave Freed a great incentive to play Goldner's records). Then, in November 1955, the Premiers walked into Manhattan's famed Bell Sound Studios (at 237 West 54th Street) and recorded two songs: "Why Do Birds Sing So Gay?" (now re-titled "Why Do Fools Fall In Love") and "Please Be Mine." They were backed by tenor sax man Jimmy Wright, leader of one of the hottest studio bands around. Of course they had no music or lead sheets, but that never stopped Jimmy Wright from putting together superb arrangements. They worked on these two tunes all day and far into the night, doing around 25 takes of "Why Do Fools Fall In Love". 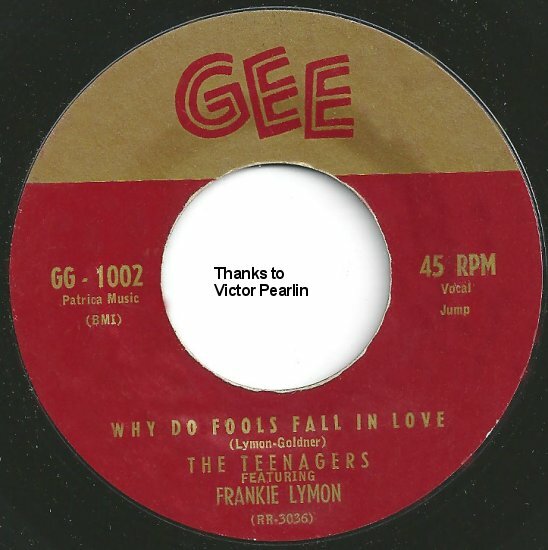 According to Jimmy, "Why Do Fools Fall In Love" became the classic it is because Goldner kept pushing Frankie to go as far as he could with it. Not only was their best song re-titled, the Premiers too were re-titled. 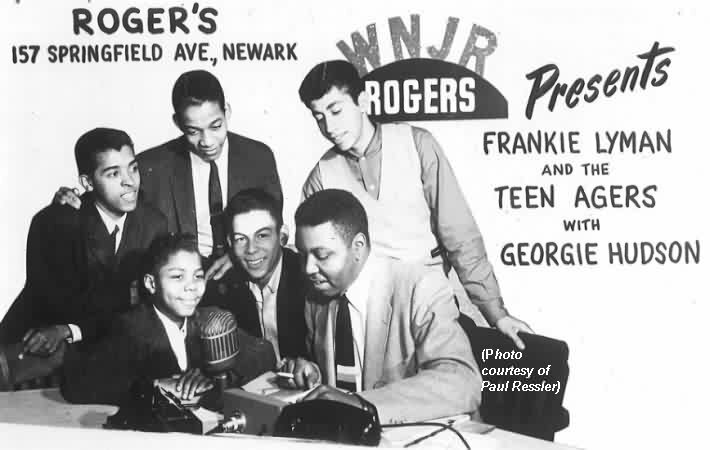 When the record was released (as Gee 1002, in the last week of December 1955), the "Premiers" had become the "Teenagers, Featuring Frankie Lymon." Jimmy Merchant says that Goldner didn't like the name "Premiers," and that Jimmy Wright suggested "Teenagers." 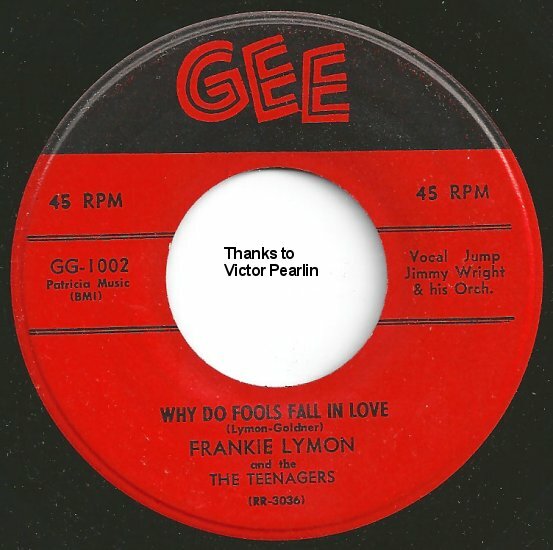 THE MANY FACES OF "WHY DO FOOLS FALL IN LOVE"
"Why Do Fools Fall In Love" got an incredible amount of local airplay, and entered the Billboard charts on February 28, 1956 (rising to #1 on the R&B charts and #6 in Pop). Now this isn't bad for a first record! (It was so big that it was covered by three of the outstanding Rhythm and Blues acts of the day: Gale Storm, Gloria Mann, and the Diamonds from Canada.) 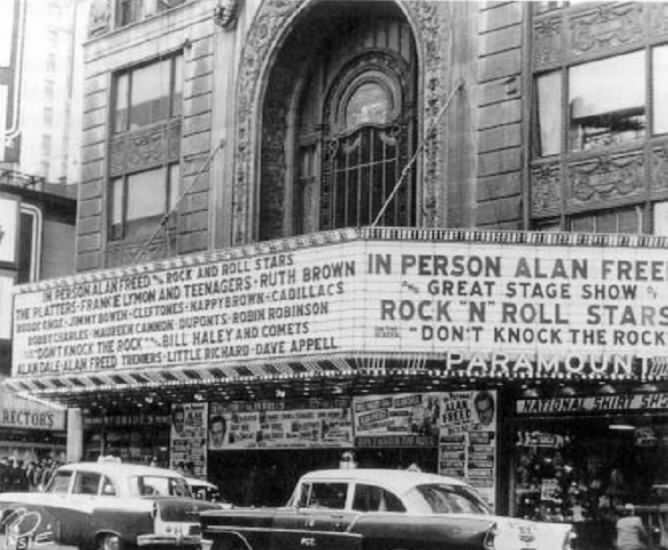 Alan Freed pushed the song (naturally) and on the strength of it, the Teenagers were booked on Freed's show at Hartford Connecticut's State Theater. They shared the bill with the Valentines (which was fitting), the Cadillacs, the Bonnie Sisters, the Turbans, the Harptones, and Fats Domino. It was here that the Teenagers picked up their first dance steps, from Cadillac Earl Wade (who suggested that they enhance their dancing repertoire by contacting choreographer Cholly Atkins). "Why Do Fools Fall In Love" deserved the fame it received; it was a very good record. 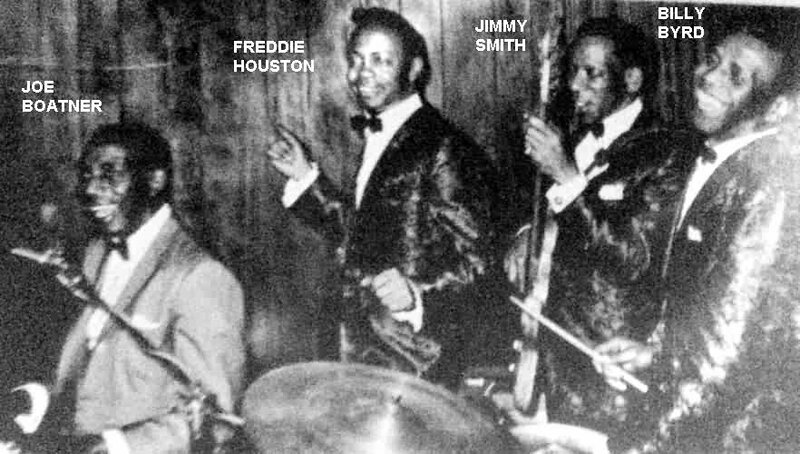 From Sherman's opening "EH DOOM AH DI DOOM AH DI DOOM AH TI DO DO," through Frankie's high-energy performance, with Jimmy Wright's frenetic wailing thrown in, it was different and it was exciting. And it was only the beginning. Actually it was such a great song that it completely eclipsed "Please Be Mine," a beautiful ballad that unfortunately still gets no recognition. 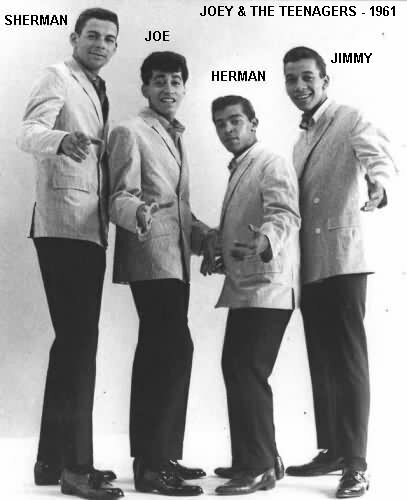 (Note that the liner notes on their first album mixed up Jimmy's and Herman's parts; only on "Please Be Mine" was Herman the first tenor and Jimmy the second tenor. However, whoever was taking notes that day happened to ask who sang what parts on "Please Be Mine," not "Why Do Fools Fall In Love"). In late February, they played the Motor City - Detroit's Riviera Theater with local WKMH DJ, Robin Seymour. The show also featured the Jewels, the Teen Queens, the 5 Keys, Ivory Joe Hunter and the Bonnie Sisters. 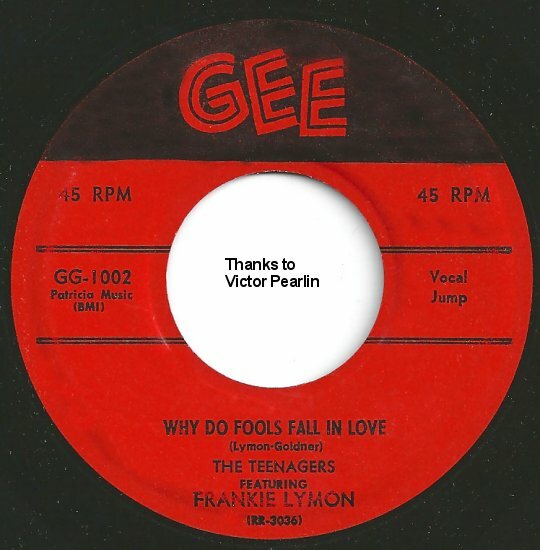 Even before "Why Do Fools Fall In Love" had entered the charts, the Teenagers were at the studio again (February 4, 1956), recording three songs: "Love Is A Clown," "Am I Fooling Myself Again?," and "I Want You To Be My Girl" (originally titled "Come On Baby"). The first two songs were kept in the can for almost a year, and the third (loosely based on the Clovers' "Hey Miss Fannie") was never released at all. A few days later (February 16) they were back in the studio doing two more tunes: a second version of "I Want You To Be My Girl" (with inspired sax work from Jimmy Wright), and a ballad, "I'm Not A Know-It-All." These sides were released in March 1956 as their second record (Gee 1012). Once again, it was up the charts, as "I Want You To Be My Girl" hit at the end of April, peaking at #3 (R&B) and #13 (Pop). 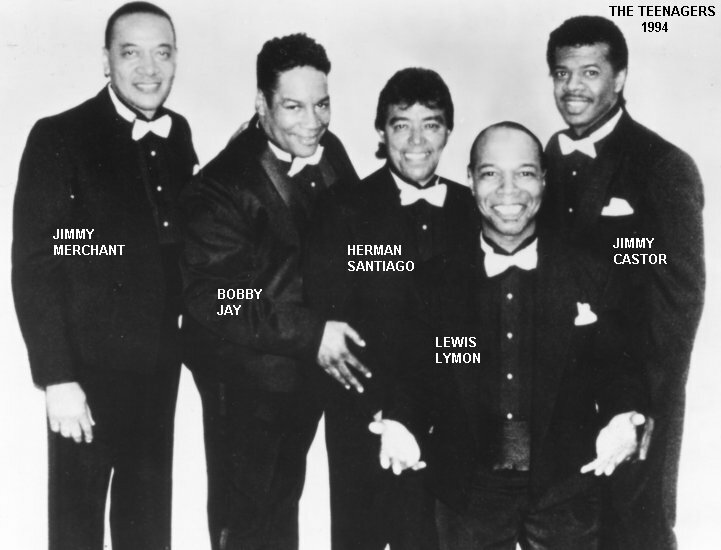 Also in April, they appeared at the Brooklyn Paramount in Alan Freed's "Easter Jubilee of Stars." Other acts were: the Platters, the Flamingos, the Royaltones, Ruth McFadden, the Cleftones, the Valentines, the Willows, Cindy and Lindy, Dori Anne Gray, the Jodimars, and the Rover Boys. (The Platters and the Teenagers would get the biggest ovations.) On April 12, they made their first TV appearance, on Chrysler's "Shower of Stars" variety show, hosted by William Lundigan. 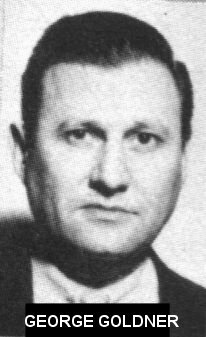 The guest host that week was Frankie Laine, who claimed that "Why Do Fools Fall In Love" was now the #1 record in the country, only three weeks after it had been recorded. Someone on the show needed to take remedial math; the song hadn't even been released three weeks after it had been recorded! In May, they became part of "The Biggest Rock 'n' Roll Show of 1956," along with Bill Haley and his Comets, Clyde McPhatter, Lavern Baker, Joe Turner, Bo Diddley, the Drifters, the Flamingos, the Teen Queens, and the Colts. This was a 45-day junket around the East Coast, the Midwest, Texas, and Canada. In June, the big time: the Apollo Theater. On the 8th they began a week with the Cleftones, the Valentines, Clyde McPhatter, the Pretenders, and Sil Austin. In July, some formal recognition: Cash Box's annual Disk Jockey Poll named the Teenagers "The Best Up-And-Coming Male Group." "The Biggest Rock 'n' Roll Show of 1956" was so popular, that they were sent out again in early July with the "Top Record Stars of 1956" tour (that went to essentially the same places). This time they shared billing with Al Hibbler, Shirley & Lee, Chuck Berry, Carl Perkins, the Spaniels, the Cleftones, and Illinois Jacquet. Sometime in the summer, they also did a tour of the British Isles. On August 23, they recorded the sides for their fourth record (Gee 1022): "The ABC's Of Love" (the final take) and the pretty ballad, "Share." Released in August, "The ABC's Of Love" (with Sherman doing "DOO BOP SHE DOO, DUM BEE UM BUM BUM") only struggled up to #42 on the Pop charts. 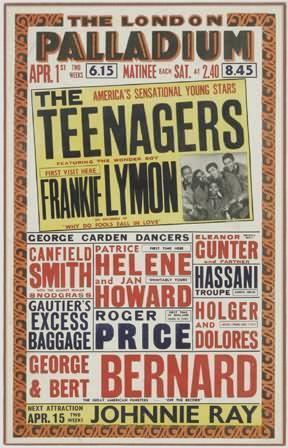 The Teenagers were featured in Alan Freed's 10-day Labor Day show at the Brooklyn Paramount, running from August 28 to September 6. Sharing the stage were: Fats Domino, the Cleftones, the Harptones, Mabel King, Joe Turner, the Penguins, Cirino & the Bow Ties, the House Rockers, and Jean Chappel. The week after the Freed show ended, the Teenagers were back at the Apollo Theater. Kicking off on September 14, the show was an All-Rama/Gee spectacular, with the Cleftones, the Valentines, the Harptones, the Joytones, Mabel King, Bob Kornegay, and the Jimmy Wright Orchestra. Right after this, most of the acts appeared at the State Theater in Hartford. In late September, they started a series of 40 one-nighters, as part of the "Biggest In-Person Show Of 1956." The Teenagers were on the bill with the Platters (these were the two hottest groups in the country at the moment), the Clovers, the Flamingos, the Ermines, and Carl Perkins. The tour played 36 cities in 17 states, plus 4 cities in Canada. This was grueling work, but the exposure was needed. It didn't hurt that they also made more money from shows then they'd ever make from record sales. However, with all the records the Teenagers sold, they only got small allowances, starting with $24 a week (the rest went into trust funds). In early October (during a lull in the tour), more recording, which produced four sides. 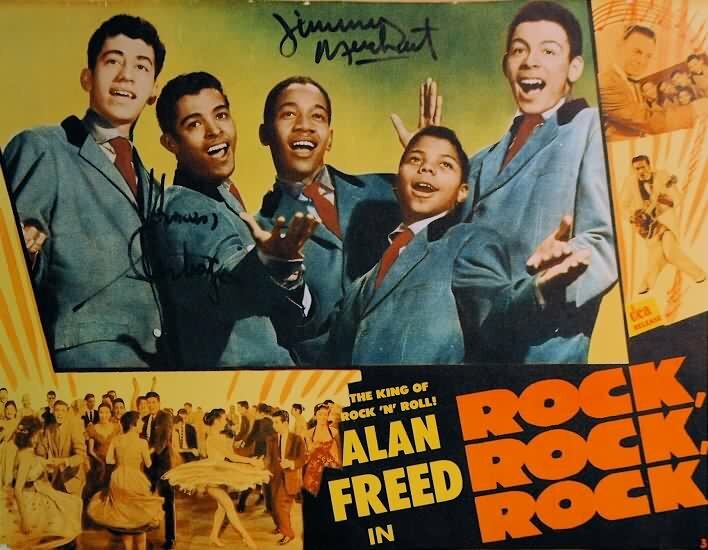 The first two, "I'm Not A Juvenile Delinquent" and "Baby Baby" were recorded to be included in the Alan Freed flick Rock, Rock, Rock. Released in November (as Gee 1026), the sides pre-dated the film by a month, and gave it some advance publicity. Although both sides got plenty of airplay (by guess which New York DJ who just happened to feature it in his upcoming film), it became their first effort not to chart (although it did go almost to the top in England). When Rock, Rock, Rock was finally released (in December), teens all over the country could see the Teenagers, the Moonglows, the Flamingos, Chuck Berry, Lavern Baker, Teddy Randazzo and the 3 Chuckles, Jimmy Wright, and several other musical acts, woven into a hopelessly inept plot. Of course the Teenagers dreamed of going to Hollywood, but their segment was filmed in a New York warehouse and intercut into the "real" movie done on the West Coast (look for a very young Valerie Harper as one of the kids "watching" the Teenagers perform in the sequence). Were we impressed with Frankie and the guys in the movie? You bet we were! Darn it, the kid was cute, and he had amazing stage presence for a someone who had just turned 14 (on September 30). 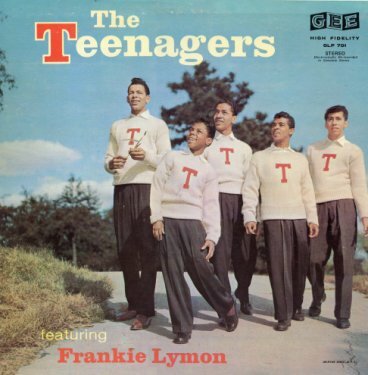 In December of 1956, George Goldner issued the first album on the Gee label: GLP-701 was simply called The Teenagers: Featuring Frankie Lymon, and contained every song that had been released to date. It also included "Love Is A Clown" and "Am I Fooling Myself Again?," recorded back in February 1956, but not yet released as a single. 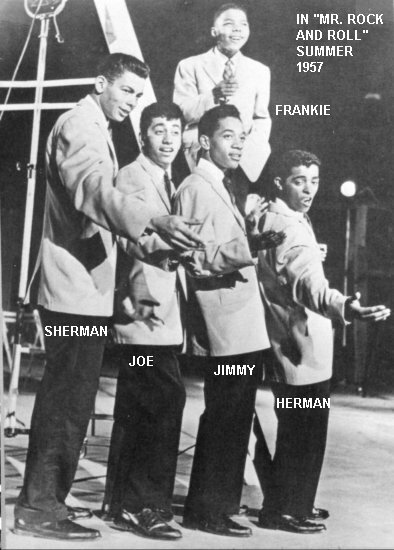 At the time of the album's release, the liner notes claimed, Frankie was 14, Sherman 15, Joe 16, Herman 16, and Jimmy 15. Actually, listening to "Love Is A Clown" you can see why Goldner held it back: it's definitely not in the same league with the great Teenagers' recordings. It isn't inspired, and Frankie isn't holding the notes too well. The saving grace is Jimmy Wright's sax solo. 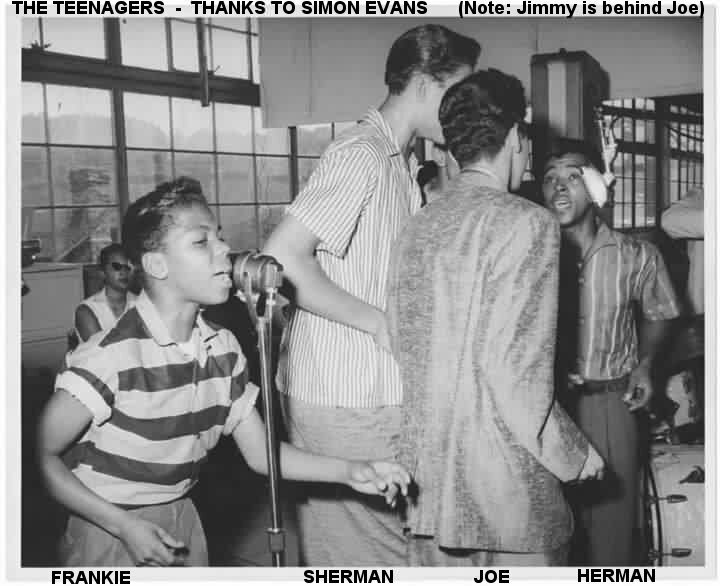 It should be noted that Jimmy did the arranging for all the Teenagers' material, as well as providing Sherman with most of his opening bass lines. The other two sides that had been recorded in October were the ballad "Paper Castles" and "Teenage Love" (which gave us Sherman's "COMA LADDIE SAY LAY BOOM"). 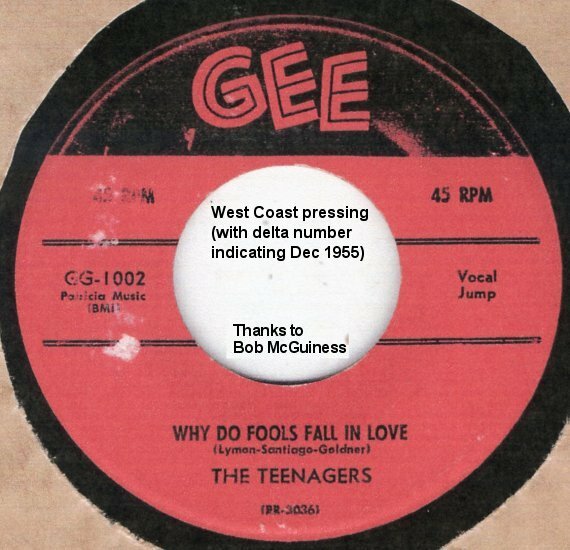 These were released in January 1957 as Gee 1032, and also failed to chart (although Alan Freed gave "Teenage Love" plenty of airplay). There were two sessions in February 1957. On the 4th, they recorded "Together," "You," and "It Would Be So Nice"; all were unreleased. (A fourth song, "I Was Alone," only got as far as having the instrumental tracks laid down, not the vocals.) "Together" has kind of a calypso beat; "You" is bouncy, but not up to par for the Teenagers; and "It Would Be So Nice" has a somewhat Latin beat, and is also below their standard. On February 13th, they recorded three more songs: "Out In The Cold Again," "Little White Lies," and "Miracle In The Rain." Wait a minute! "Out In The Cold Again"? "Little White Lies"? 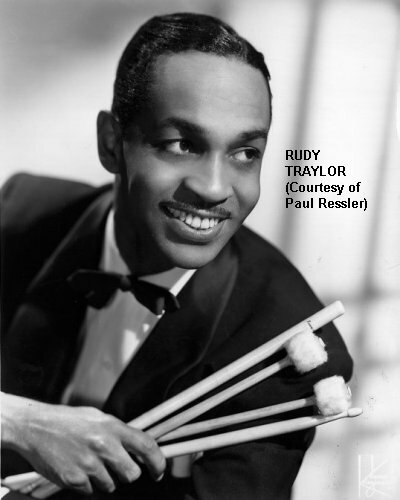 The former was written by Ted Koehler ("Stormy Weather," "I've Got The World On A String") and Rube Bloom ("Fools Rush In," "Maybe You'll Be There"); the latter was written for Guy Lombardo in 1930. What's going on here? Well, there's good news and there's bad news. The good news is that the Teenagers took "Out In The Cold Again" and made it into (in my opinion) their finest ballad; the bad news is that "Little White Lies," while a decent up-tempo tune, isn't exciting, isn't what the Teenagers are all about (and there's a hint that Frankie's voice is lowering a bit). "Little White Lies" was never put on a single, only on the Pajama Party album released in October 1957. Also in February, they appeared at Alan Freed's Washington's Birthday show. This one was at the New York Paramount, and featured the Platters, the Cleftones, the Cadillacs, Nappy Brown, Ruth Brown, Buddy Knox, Jimmy Bowen, Robin Robinson, Maureen Cannon, and Bobby Charles, and an obscure local group called the Duponts (whose lead singer, in a "kid-sound" vein, would soon become "Little Anthony"). These shows were grueling, and one morning Sherman overslept and had to be replaced, for the first show, by Warren Corbin, bass of the Cleftones. 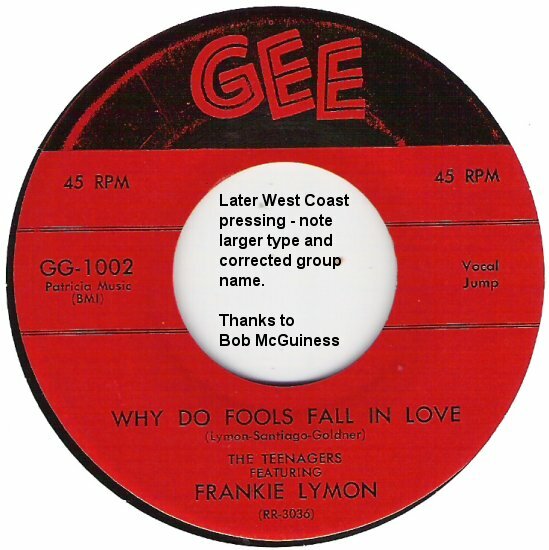 In March 1957, Gee released "Love Is A Clown," backed with "Am I Fooling Myself Again?" as Gee 1035. Neither side charted. Also in March, "Out In The Cold Again" and "Miracle In The Rain" were paired as Gee 1036. The odd thing about Gee 1036 is that the group was missing on "Miracle In The Rain." That's right, although the label said "Teenagers" there was only a single voice to be heard. The song was given to the group at the last moment (actually at the recording session). Since it was easy for the lead singer to learn it, without anyone having to devise intricate background harmonies, Frankie was told to record it and "the group would put in the rest later." The cracks were starting to appear. Also, look what kind of material the Teenagers are recording. Here's one of the top five Rock and Roll groups in the country, and they're being given almost exclusively pop standard material. Now it's true that Fats Domino had had hits in 1956 with the standards "When My Dreamboat Comes Home" and "Blueberry Hill," but it seems like the Teenagers are now recording nothing but pop! An unusual tour for a Rock and Roll group: in the Spring of 1957, the Teenagers did some performances in Panama City and Colón, in Panama. When they got back, at the end of March, it was off on another tour of England (their first had been the previous summer), which lasted for 12 weeks. This time, they got to play the London Palladium, possibly the most prestigious theater in the world. They not only impressed the crowds at the theater, they impressed the management of their London hotel (by making a mess of the place and generally acting like the feared "Ugly Americans" - try to picture this precocious 14-year-old smoking the biggest cigar he could find). Frankie also shocked the world by admitting that his favorite music was progressive jazz. On May 23, 1957, Frankie recorded "Love Is The Thing," "Glow Worm," "You Can't Be True," "Begin The Beguine," "Goody Goody," and "Yours." On June 3, 1957, he did "Fools Rush In," "You Were Only Fooling," "Too Young," "Guilty," "As Time Goes By," "Don't Take Your Love," "Blue Moon," "These Foolish Things," "Over The Rainbow," and "Ghost Of A Chance." On June 19, 1957, it was "Goody Goody" (second version), "Creation Of Love," "Fortunate Fellow," and "Love Put Me Out Of My Head." Note what kind of songs these are: they're mostly old pop standards; Frankie was being pushed into a pop career. 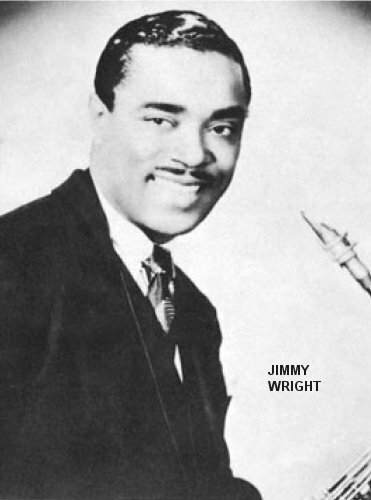 Gone is the frenetic sound of the Jimmy Wright Band, now there's Rudy Traylor's Orchestra, with lush strings! They knew. The Teenagers had been tight and Goldner couldn't surprise them with a breakup. How was it handled? "It was awful," says Jimmy. "The group was divided by management while we were in Europe." So what happened to all these songs? For the most part they were unreleased! 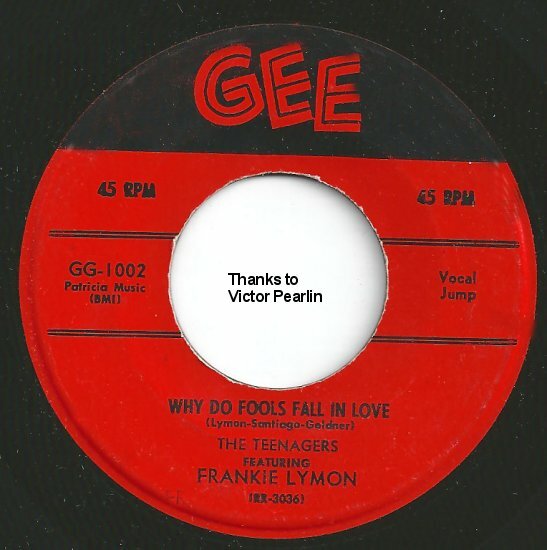 The exceptions were: "Yours," "Fools Rush In," "You Were Only Fooling," "Too Young," "Goody Goody" (the second take), and "Creation Of Love," all of which turned up on a Roulette album in September 1957 called Frankie Lymon at the London Palladium. (Roulette was another Goldner label, but by then Goldner had sold out to Morris Levy). As soon as they returned from England (in late June), the Teenagers were rushed into the studio to dub in backgrounds to three of the tunes: "Begin The Beguine," "Fortunate Fellow," and "Love Put Me Out Of My Head." 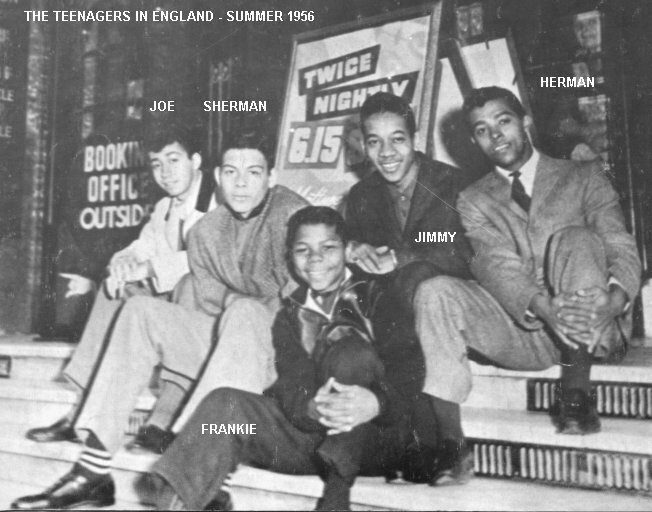 "Begin The Beguine" is, without a doubt, the oddest Teenagers record, it mostly features the bass lead of Sherman Garnes, in a tribute to Jimmy Ricks. Frankie is only heard at the end, when he sings the last stanza. Aside from being over-orchestrated, with a weak performance from Jimmy, Herman, and Joe, it's quite a good effort by Sherman and Frankie. However, it, too, was unreleased. This was to be part of the "standards" to be included on the Frankie Lymon and the Teenagers at the London Palladium album. Says Jimmy, "We were finally going to have a shot at others doing the lead." "Fortunate Fellow" and "Love Put Me Out Of My Head," while never released on any single or album, were nevertheless incorporated into Mr. Rock And Roll. (This opus, released in October 1957, also featured Chuck Berry, Little Richard, Lavern Baker, Clyde McPhatter, Brook Benton, and the Moonglows.) The Teenagers' act was nowhere near as frenetic as their performance in Rock, Rock, Rock. Jimmy says that it was like a marriage gone sour, like two spouses facing each other in a divorce court; this isn't conducive to a memorable performance. Note that the two tunes aren't very good either; it barely sounds like the Teenagers at all and Jimmy Wright's band has been replaced by an orchestra full of excellent musicians, who haven't a clue as to what they should be playing (muted trumpets don't really belong in a Teenagers recording, do they?). According to Jimmy, the songs aren't up to par because the Teenagers didn't work on them "as a group; so it didn't sound exciting-it was like a blind date; uncomfortable." 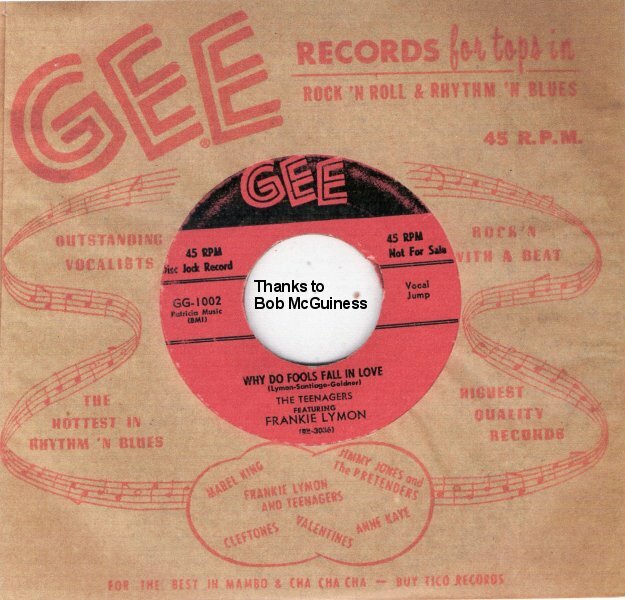 The only single to emerge from all of Frankie's British recording sessions, in June 1957, was Gee 1039, "Goody Goody" and "Creation Of Love." 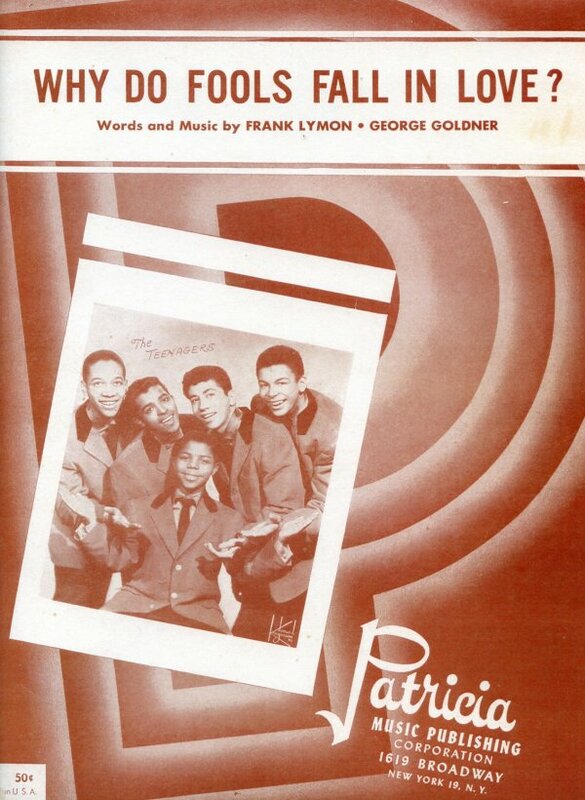 While "Goody Goody" sounds like the Teenagers, it's actually Frankie with a chorus (in all probability the Ray Charles Singers, doing a creditable job of imitating a Rock and Roll group). The Teenagers were supposed to back him on the record (they had been practicing it), but according to Jimmy, it isn't them. To make it more confusing, Gee advertised "Goody Goody" as being by the whole group. Teenagers or not, the song made it to #20 on the Pop charts. The chorus is also present on "Creation Of Love," but you'd never confuse them with the Teenagers on that one! Actually "Creation Of Love" is good in spite of the chorus; it would have been a great recording had the Teenagers been on it. And that was it. 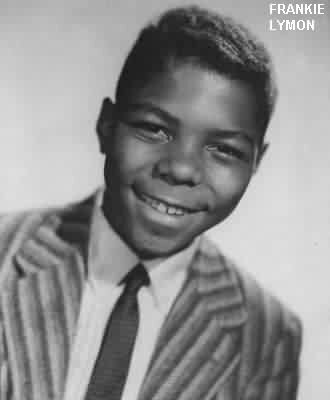 There were only 22 sides recorded by Frankie Lymon and the Teenagers: 15 were released on singles; 1 was only on an album ("Little White Lies"); 2 were done for a movie, but never appeared on disk ("Fortunate Fellow" and "Love Put Me Out Of My Head"); and 4 were hidden from the public altogether ("Together," "You," "It Would Be So Nice," and "Begin The Beguine"). "They had Frankie convinced that this was it. He didn't seem to have any sorrow." Jimmy says that Frankie, in effect, never looked back. In fact, Jimmy only saw him twice more, and both times Frankie was somewhat "aloof." On July 19, Frankie did a solo spot (probably his first) on the week-old "Big Beat" TV show, hosted by Alan Freed. The whole group had originally been booked, but that was over now. (Another performer on that show was an unknown Bobby Darin.) At the end of the show, Freed invited the audience to come down and dance as the credits were rolling. What Freed probably didn't see, but the TV audiences did, was Frankie choosing a white girl to dance with. With stations all throughout the South cancelling the show, it was off the air in two more weeks. In early August, the break-up was officially announced; on August 14 Frankie did another session for Roulette. This time he was backed by Hugo Peretti's Orchestra (he's half of Hugo and Luigi, who were functioning as Roulette's A&R men) and another chorus. The clear winner from this session was "My Girl," which failed to chart. Other tunes were "So Goes My Love," "It's Christmas Once Again," "My Baby Just Cares For Me," and "Somebody Loves Me." He's still being pushed in a Pop direction. Soon after, in early September, he did another session which waxed "Silent Night," "Little Girl," and "Let's Fall In Love." More and more and more Pop! September's "Biggest Show of Stars for 1957" featured Frankie Lymon, Fats Domino, Clyde McPhatter, Lavern Baker, Chuck Berry, the Spaniels, the Bobbettes, the Drifters, and Johnnie & Joe. 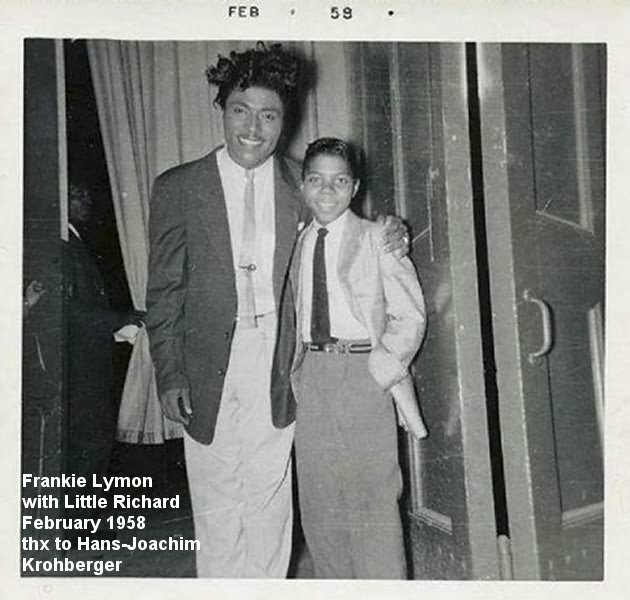 Later that month, Frankie was in Los Angeles, doing a show with Lavern Baker, Richard Berry and the Pharaohs, Young Jessie, and the Flips. And while all this was going on, what were the Teenagers doing? Well, sadly, nothing for a while. They did a show with "Jocko" Henderson in Newark in September (with Screamin' Jay Hawkins, Doc Bagby, Lee Andrews and the Hearts, the Channels, the Shells, and the Chantels). They were also listed as being part of the "80 Days" tour (presumably named after the hit movie Around The World In 80 Days), with the Spaniels, Fats Domino, the Drifters, and Chuck Berry, but when the curtain went up, there were no Teenagers. It took them until November 12 to get back into the studio with a new lead singer. Some girls that they knew had told them about a white kid named Billy Lubrano (although he usually spelled it "Lobrano"), who attended Forest Hills High School in Queens, and who could sing all their songs. Talk about integration: now the group had two blacks, two Hispanics, and a white lead! What they didn't have was a sound that anyone wanted. Jimmy said that Billy "sounded like Liz Taylor's husband" (a reference to Eddie Fisher). Was this a bad thing? At the time, it didn't seem so. "We didn't have any guidance," said Jimmy. "We didn't want the same sound as we had with Frankie." The session produced November's Gee 1046, "Flip Flop" (which got some airplay and then flopped) and "Everything To Me" (the flip, which also flopped). They did a tour with Roy Hamilton, but other, more lucrative gigs that had been lined up previously, faded away. The last appearance of any note was the Alan Freed Christmas Show at the New York Paramount in December 1957. The show starred Fats Domino, Jerry Lee Lewis, Lee Andrews and the Hearts, Little Joe and the Thrillers, Thurston Harris, Paul Anka, Jo-Ann Campbell, the Dubs, the Everly Brothers, Danny and the Juniors, Terry Noland, the Rays, the Shepherd Sisters, the Twintones, and Buddy Holly and the Crickets. 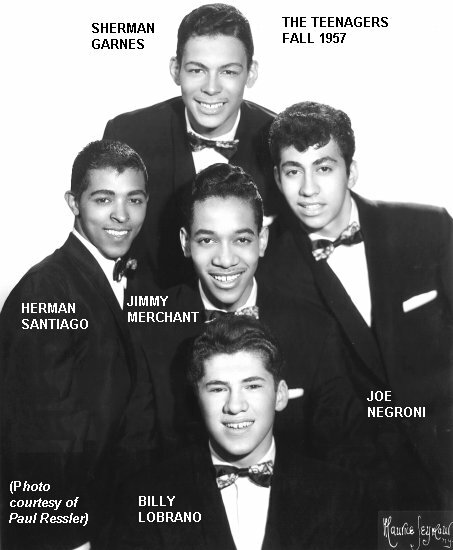 Billy Lobrano recorded one more session with them (late March 1958), out of which came "Good Lovin'," "Mama Wanna Rock," and "My Broken Heart." The first was never released, and the others were paired, on Roulette (a label allied with Gee), in June. On May 2, 1958, they began a week at the Apollo, this time with Ruth Brown, Cootie Williams, Wini Brown, Nipsey Russell, the Cha Cha Taps, the 2 Kit Kats, and Juanita Moore. As far as Jimmy can remember, Billy Lobrano lasted until the end of 1958. (Although, since Jimmy said that Billy wanted to go off to college to study medicine, it's possible that he remained through the spring of 1959.) "That was the mistake that changed the course of the Teenagers", said Jimmy. "We should have gotten another Frankie Lymon." Meanwhile, Frankie was singing his heart out for Roulette. December 20, 1957 saw him do "Thumb Thumb" (a pretty good Rock and Roll piece), "Portable On My Shoulder" (before the age of boom boxes), "Footsteps," and "That's The Way Love Goes." 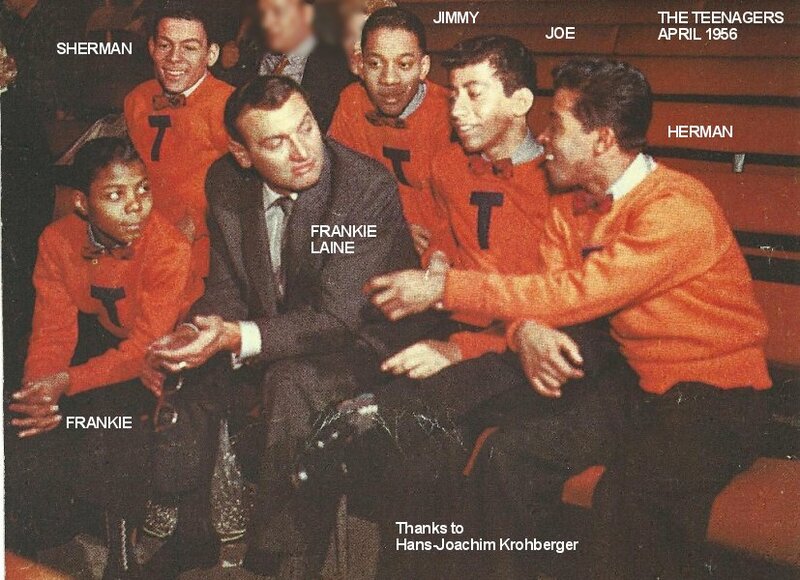 The year 1958 was prolific for Frankie; he recorded 25 tunes. 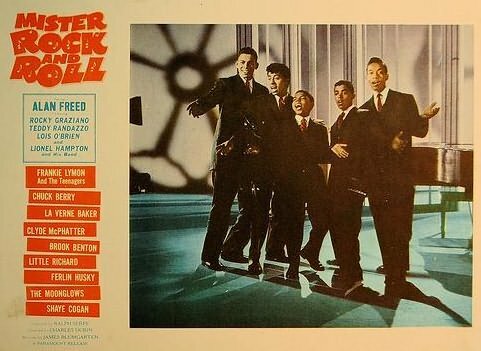 Twelve of them, recorded on March 24 and 25, were covers of other acts' Rock and Roll material, and wound up on a Roulette album called Frankie Lymon: Rock'n Roll released in July. They were: "Wake Up Little Susie," "Short Fat Fannie," "Waitin' In School," "Next Time You See Me," "Jailhouse Rock," "Buzz Buzz Buzz," "Searchin'," "Silhouettes," "It Hurts To Be In Love," "Diana," "Little Bitty Pretty One," and "Send For Me." A few days later (March 31) he recorded "Mama Don't Allow It" and "Girls Were Made For Boys." In June he did "Human Nature," "Now Or Never," "Campus Queen," and "Little Orange Annie." July saw "Only Way To Love," "No Matter What You've Done," and "Melinda." In September it was "Ain't She Sweet," and "Rockin' Tambourine." Some of these made it to singles, but most were either on the Rock'n Roll album or remained unreleased. Clearly, Frankie was fighting for his professional life as much as the Teenagers. He did a further 14 sides in 1959, of which only 5 were released. A single 1960 session saw nothing released. The unspeakable had happened: Frankie's signature voice had changed. What was he now? He sounded somewhat like he belonged in a Las Vegas lounge. Not a bad voice, actually, but for a 17 year-old in 1959, that wasn't what the public wanted. His last chart hit was the 1960 release of "Little Bitty Pretty One," which made it to #58 (R&B). On March 30, 1960, the Teenagers did a session for End Records. (After George Goldner had sold off Gee, Roulette, Rama, and Tico to Morris Levy, he started up End and Gone, having many late '50s and early '60s hits, none of them by the Teenagers.) The March session produced "Crying" and "Tonight's The Night." Herman wasn't around at this time and they quickly brought in Howard Kenny Bobo (formerly of Jimmy Castor's Juniors) to replace him. He was from the neighborhood and "Kenny and I hit it right off from the beginning," said Jimmy. When Jimmy moved to Manhattan from the Bronx in September 1954, Kenny was one of the first friends he made. 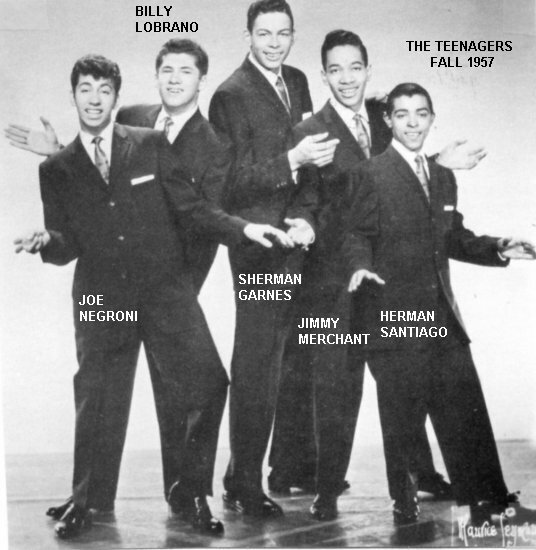 Joe Negroni led on "Crying" and Kenny Bobo did lead chores on "Tonight's The Night". The sides were released on End in May, but went nowhere. Kenny was only with the group for "a couple of seconds" before Herman returned. On May 22, 1960, they appeared at WHOM DJ Ralph Cooper's Sunday Record Hop at the Audubon Ballroom in Manhattan. Others on the bill were the Cadillacs, Titus Turner, Norven Baskerville & the Admirations, Richard Barrett & the Sevilles, Tony Middleton, the Holidays, and Riff Ruffin. Then, someone told them that "I've got just the guy for you guys." His name was Freddie Houston, who had a powerful, mature tenor voice. This was more the sound that they'd been looking for. 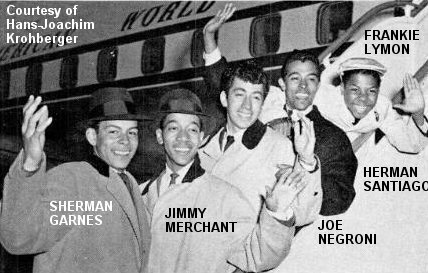 There was a single record on Columbia, in June of 1961: "What's On Your Mind" (by "Joey And The Teenagers"; recorded March 29) featured Joe Negroni, and "The Draw" (by "Sherman And The Teenagers"; recorded May 23) was led by Sherman Garnes. In spite of "The Draw" being one of Leiber and Stoller's "playlets," it failed to click. And that was it for the Teenagers' recording career. Immediately, after these sessions, they added a fifth voice to the group: Sandra Doyle. She was the daughter of a woman that Nick, their manager, was dating. (He was Leroy "Nick" Smith, who'd been in the Colts.) 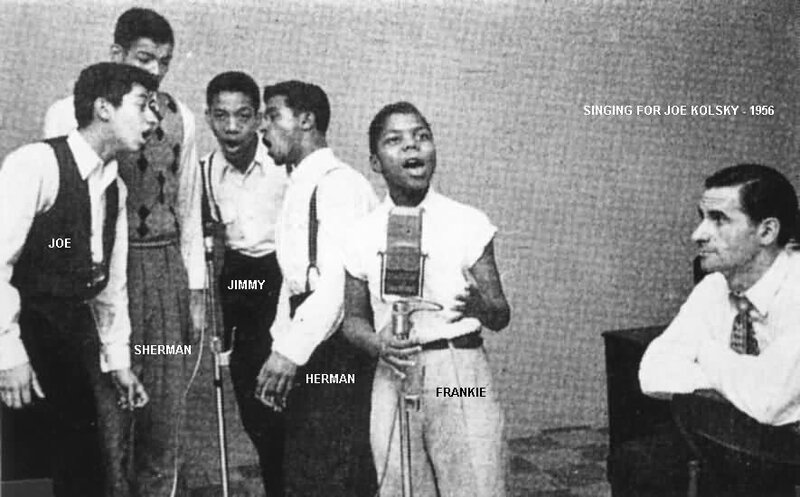 Nick convinced them that only a female voice could re-create the Frankie Lymon sound and, of course, he was right; they'd never find a male voice that could compare. They made at least two further appearances at the Apollo. 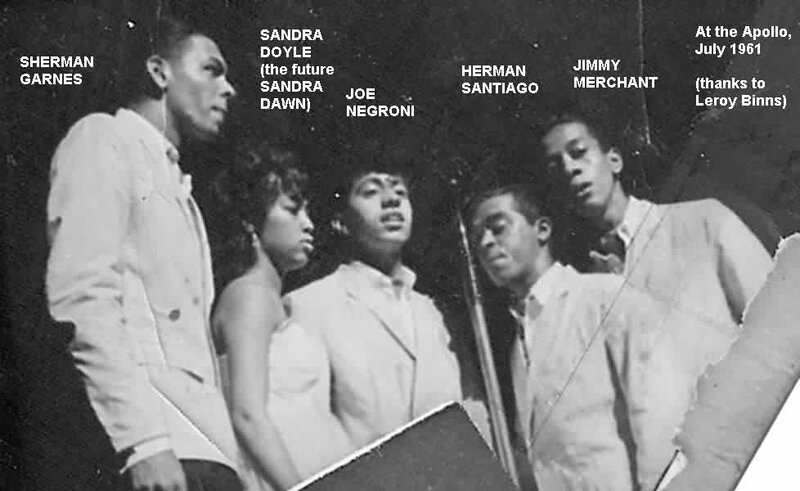 The first, on July 28, 1961 (at an Alan Fredericks Old Goldies show), found them with some old friends: the Solitaires, the Dubs, the Charts, Johnnie & Joe, the Cadillacs, the Cleftones, the Del Vikings, the Bobbettes, and Sil Austin. Then it was off on the Chittlin' Circuit tour (the Howard, the Royal, the Regal, the Earle, etc.). The last Apollo show was the week of September 29, 1961 in another Old Goldies show, this time along with Sonny Til & the Orioles, Little Anthony, Shirley & Lee, Little Joe, the Valentines, Charlie & Ray, and Robert & Johnny. After these shows, Sandra Doyle departed. You'll run into her again in your travels, however: she changed her name to "Sandra Dawn" and was part of the Chantels (on Ludix) in 1963, and then the Platters by the end of 1965. She was briefly replaced, for a single performance, at Crocitto's on Staten Island, on November 17, by Lana (last name unknown), Sherman's future wife. And then, it was all over for the Teenagers. By the end of 1961, the group was history. For a while, at any rate. Roulette did two sessions with Frankie in 1961, which actually resulted in two singles: "Change Partners"/"So Young" and "I Put The Bomp"/"Young." Neither charted, but the worst was yet to come. After the second session, Frankie was admitted to a drug rehabilitation center. Jimmy Merchant explained it as being the down side to still being in the business after the hits have stopped. You look for a replacement. Frankie's compensation was drugs, which were easy enough to come by in the entertainment industry. Frankie became a pariah. He was reduced to calling up booking agents and club owners and begging for work. He continued to record, having a single release for 20th Century Fox's TCF subsidiary (1963) and one for Columbia (1964; the same year that he was arrested for drug possession). In the mid-60s, he appeared on TV, on one of the frenetic "teenage music" shows (probably "Hollywood A Go-Go"), lip-synching the group's "Why Do Fools Fall In Love" Then, he joined the army and seemed, by the time he got out, to have kicked the drug habit. Upon his discharge, he got a new manager, Sam Bray, and recorded two sides for Bray's Big Apple label: "I'm Sorry" and "Seabreeze." Bray then got Frankie a session with Roulette for February 29, 1968. 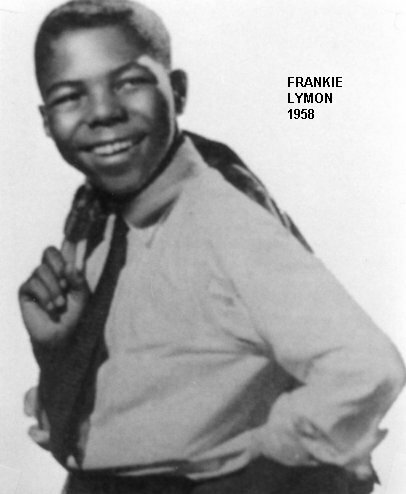 To celebrate, Frankie Lymon went on a drug binge the night before; he picked up a needle and snuffed out his life. That simple. He was 25. (Later that year Bray released "I'm Sorry" and "Seabreeze" as Big Apple 100; it would be the last time Frankie's voice would be heard on record.) An era had come to an end. 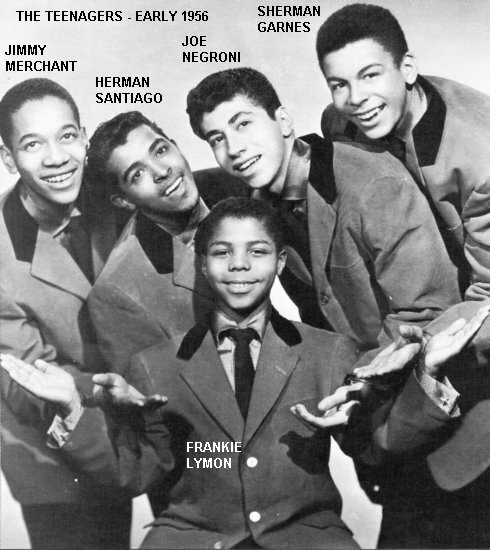 What was the legacy of Frankie Lymon and the Teenagers? They created a whole new form of music: "Kid Sound." Arrangements became simpler, lyrics lost their sophistication (most of the groups didn't go in for the Pop standards that the Teenagers recorded), audiences got younger, and a lead singer whose voice hadn't yet lowered was almost assured of a recording contract. Some unbelieveably abysmal music came out of this trend. On the other hand, we were also treated to the wonderful sounds of Little Anthony and the Imperials, the Schoolboys, the Chanters, and even Frankie's brother, Lewis Lymon, and his group, the Teenchords). It's impossible to calculate how many groups were influenced by the Teenagers; but they were! 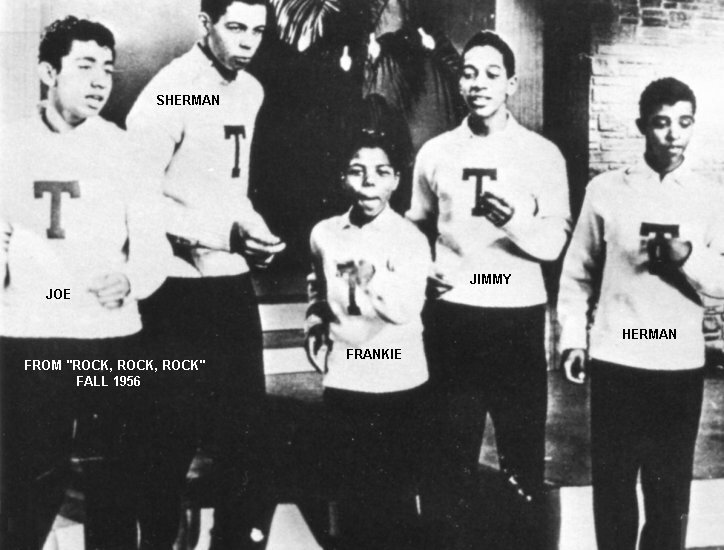 Probably even the Jackson 5 had some of their roots in the Teenagers. 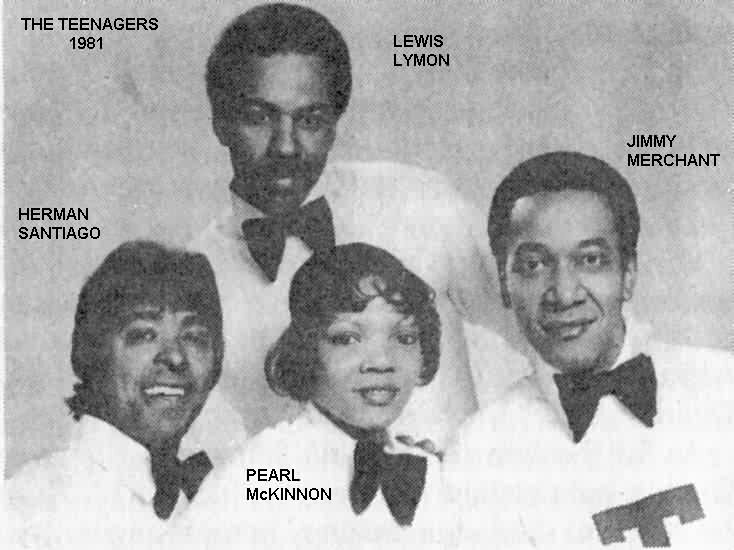 The Teenagers reunited in 1973, this time using the talents of Pearl McKinnon, former lead of the Kodoks (who sounded very much like Frankie Lymon). It became almost impossible to find a male voice to imitate the clear soprano of a 13-year-old. That only lasted for a matter of months, however, and the group fell apart again. 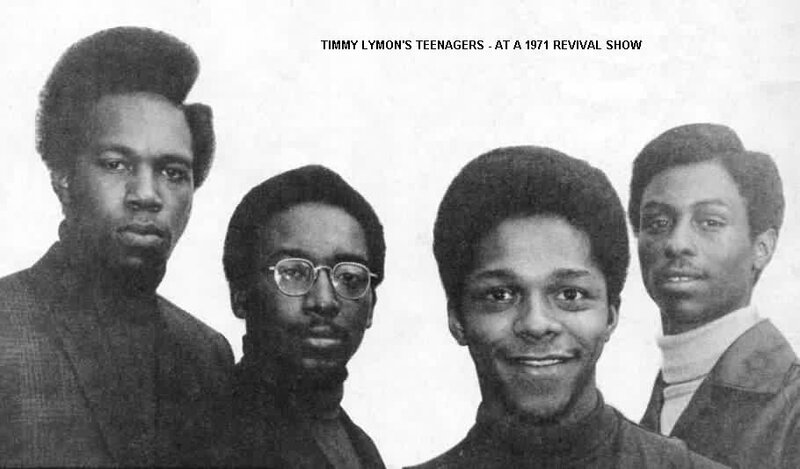 Note that in 1971, Frankie's youngest brother, Timmy Lymon, put together a Teenagers group for a few shows. Sadly, Sherman Garnes died on February 26, 1977, followed the next year by Joe Negroni on September 5, 1978. Billy Lobrano passed away on April 19, 2007. 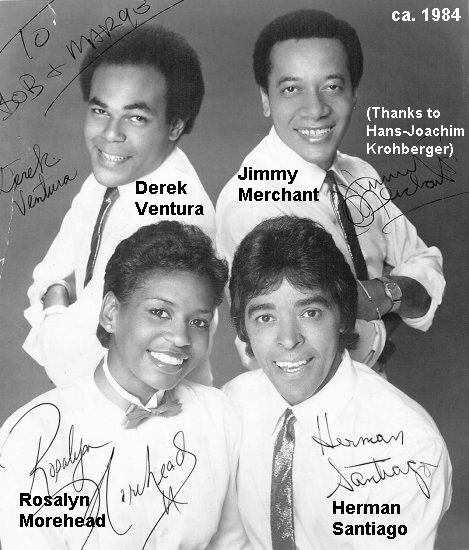 Starting in 1980, Jimmy Merchant and Herman Santiago kept a Teenagers group going, but for a long while the magic was gone. When this article was originally written (March 1995), some of the old magic had returned. 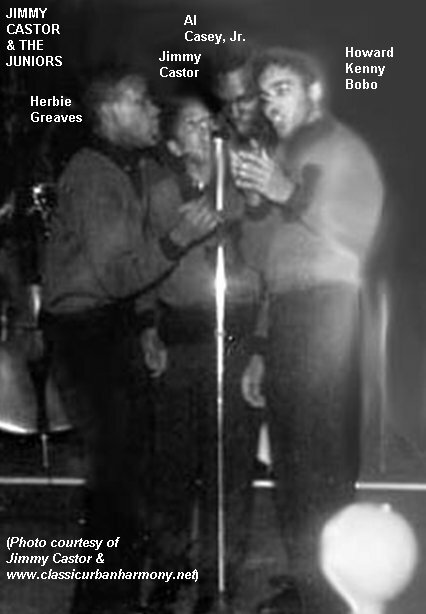 At that point the group was: Jimmy Castor (lead), Herman Santiago (now a first tenor), Lewis Lymon (second tenor), Jimmy Merchant (now a baritone), and Bobby Jay (bass; he'd been with the Laddins). They appeared around the country and went to Europe twice. By the end of the 90s, Jimmy Castor had left and Timothy Wilson (of Tiny Tim and the Hits) had replaced him. 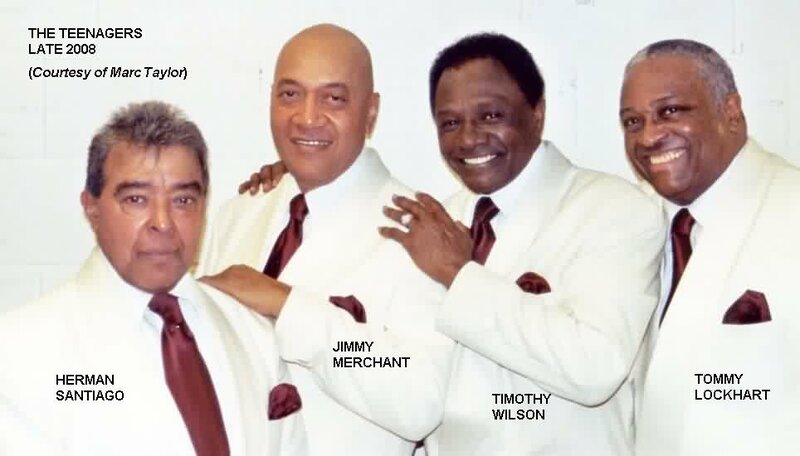 In 2007, the group consisted of Timothy Wilson, Herman Santiago, Dickie Harmon, and Bobby Jay. In late 2008 Jimmy Merchant and Herman Santiago had teamed up again, with Timothy Wilson still in the lead and Tommy Lockhart as bass. Frankie had his faults, but he was a consummate showman, and his was the voice and the talent that drove the Teenagers to the top. Would they have lasted if they had stayed together singing exciting Rock and Roll material? Alas, the answer is, as always, "who knows?" But we had them for a while. And we still have their music. It's ridiculous to say that any act will be remembered "for all time"; but it's my bet that the Teenagers will be remembered longer than most. 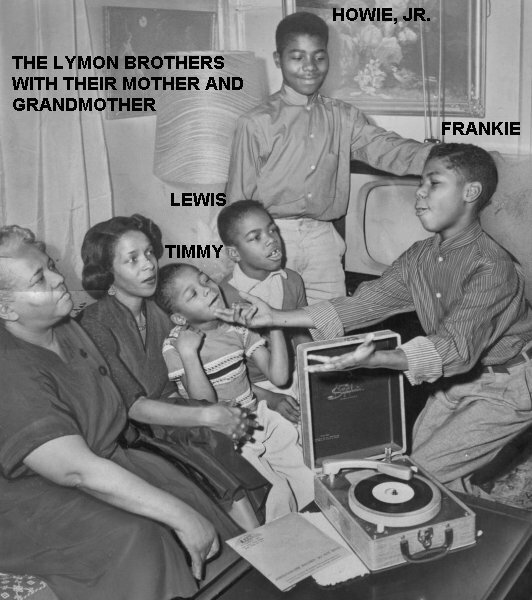 ** Both sides listed as by "Frankie Lymon And The Teenagers," however it's the Ray Charles Singers backing Frankie. Fortunate Fellow **** - ?? *** Instrumental track only; vocals never added. vocals and assigned master numbers 9004 and 9003.